Essential Services provides installation, repair, and maintenance of heating and air conditioning systems for all of your energy needs. We can provide you with an efficient HVAC system that can save you $$$. Our air conditioning and heating installations and repairs will be performed with honesty and integrity. You can trust our technicians to quickly and efficiently meet your needs. We will respond 24 hours a day to your needs. We are based in Waxahachie, TX, but we will service the entire DFW Metroplex. When your comfort is at stake, let Essential Services take care of you and your family with a new air conditioning and heating system. 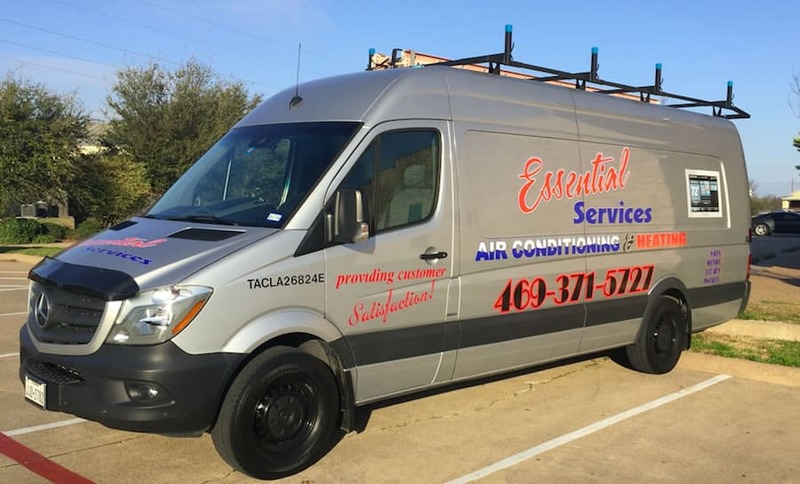 We’ve been providing Waxahachie with the best AC repair since 2007. Being in Waxahachie for so long, we understand how important your comfort is, especially during the Summer-time. Nothing is worse than for the air conditioning unit to go out during our famous 110 degree weather. We offer complete HVAC service and repair on all makes and models of heat pump systems and air conditioning systems. Essential Services is one of Waxahachie’s top air conditioning repair and service companies. We provide service to Waxahachie and the surrounding areas, including, Red Oak, Ennis, Midlothian, Cedar Hill, DeSoto, Duncanville, Ovilla, Palmer and the entire DFW metroplex. Our company can handle any of your AC repair or installation needs, handling it with the professionalism and expertise you deserve. Making the decision to invest in a heating and air conditioning installation or replacement system is hard enough without adding the countless companies who all promise the same thing. Essential Services has years of industry knowledge to help you choose the right heating and air conditioning system at the right price. Replacing your heating and air conditioning system has so many advantages. Cheaper electric bills, tax credits, saving money on costly break downs mid-season and, not to mention, being comfortable in your home during EVERY season. We are committed to helping you solve your heating and air conditioning needs. If you have a problem, just give us a call and we will take care of them. Don’t wait another day in the heat! If your air conditioner unit is getting some years on it, you might consider replacing it. Units now are much more energy efficient than those purchased in the early 1990’s. You may be able to save as much as 40% on your energy cost for cooling by replacing an old unit. We can help you figure out if your air conditioning system is the right size to give you maximum efficiency. Several factors determine the size of unit you need. Our specialist will look at the size of your area, windows, doors, insulation, potential air leaks, and the amount of heat that your home’s occupants might generate. Getting the right size air conditioner for your home is crucial in getting maximum efficiency for your home’s cooling.